The danger, if you can call it that, of regularly watching Lionel Messi play soccer—which is to say, to watch one man routinely perform stupefying acts of brilliance the likes of which you’ve never seen before—is that at some point, you run the risk of becoming inured to it. 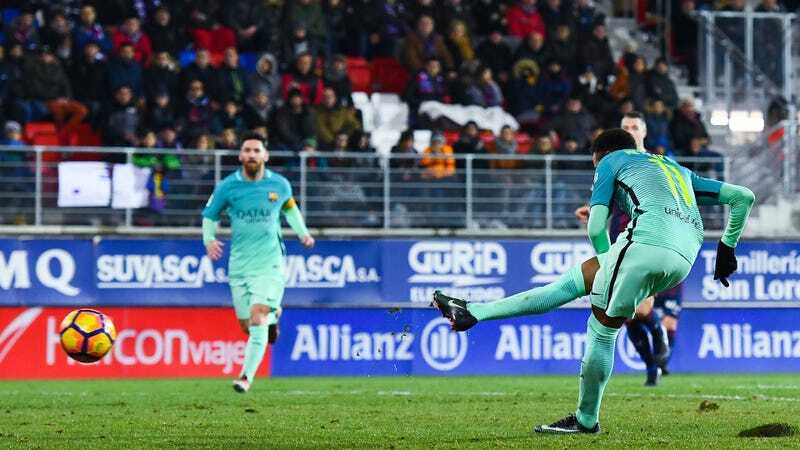 Oh, Messi took on four defenders trying to break his shins, you might find yourself thinking, beat them all with a head-fake and a pirouette, then slid into the box and flipped it over the keeper and into the net; yawn, I’ve seen him do that against eight guys. Or maybe, Neat, he just slapped a heat-seeking through ball from halfway across the pitch that sailed over the entire back line and hit Neymar perfectly in stride, squarely on the big toe of his right foot, but Neymar missed the shot so eh. When genius becomes commonplace—becomes expected, even—it can lose some of its visceral thrill. Don’t let that happen to you. Watch this compilation of some of Messi’s passes from yesterday’s game against Eibar in La Liga—again, just some of his more astounding passes; it doesn’t include all of his dribbles and shots and the goal he scored in the 4-0 blowout that he played the key role in orchestrating, even if he only directly contributed to one of the goals—and remember that the vision and technique and balance and awareness and audacity it takes to see, try, and complete these passes is simply unreal. This one guy is the best at everything, and does it all nearly every single game. Messi remains must-watch TV. And if, while watching, you aren’t continually brought to your knees in awe at what he does, if your face doesn’t still to this day twist up in an unrecognizable scowl six or seven times a match when he does the impossible, then you’re doing it wrong.